Deflation Is Winning – Beware! Deflation is back on the front burner and it's going to destroy all of the careful central planning and related market manipulation of the past 6 years. Clear signs from the periphery indicate that a destructive deflationary pulse has been unleashed. Tanking commodity prices are confirming that idea. Whole groups of enterprises involved in mining and energy are about to be destroyed. And the commodity-heavy nations of Canada, Australia and Brazil are in for a very rough ride. Whether the central banks can keep all of their carefully-propped equity and bond markets elevated throughout the next part of the cycle remains to be seen. We know they will try very hard. They certainly are increasingly willing to use any all tools at their disposal to keep the status quo going for as long as possible. Whether it’s the People’s Bank of China stepping in to the market to buy 10% stakes in major Chinese corporations in a matter of weeks, the Bank Of Japan becoming the majority owner of key ETFs in the Japanese markets, or the Swiss National Bank purchasing $100 billion of various global equities, we see the same desperation. Equity prices are being propped, jammed and extended higher and higher without regard to risk or repurcussions. It makes us wonder: Why haven’t humans ever thought to print their way to prosperity before? Well, that’s the problem. They have. And it has always ended up disastrously. History shows that the closest thing that economics has to an inviolable law is: There’s no such thing as a free lunch. Sadly, all of our decision-makers are trying their hardest to ignore that truth. So how will all of this progress from here? One of the models of the future that I favor is the Ka-Poom theory put out by Erik Janszen of iTulip.com back in 1999. Basically it states that the end of a bubble era begins with a sharp deflationary event (the ‘Ka’ part of the title), but ends in a highly inflationary blow-off, (the ‘Poom’). It’s a one-two punch. Down then up. The reason you get the deflationary portion is simply because bubbles always burst. They are seeking a pin from the moment they are born. The logic for the inflationary secondary reaction is that the central banks always respond to deflation with more money printing. Ironically, this is a doomed attempt to stem the damage caused by their prior money printing efforts. So that’s what we’re looking for here at Peak Prosperity: a deflationary crunch savage enough to scare the central banks into opening the monetary spigots even wider. But this next time, we think they’ll seek to goose economic growth by giving money directly to the people as well as non-bank corporations. And we think that deflationary bust has already begun. Our record-high stock markets simply somehow haven’t gotten the memo yet. So that’s it: prices first go down (Ka!) and then they rocket back up (Poom!). When it's all over some years down the line, many of the world's fiat currencies (Yen, Euro, Bolivar, Real, and maybe a few Pesos and the Rupee, too) will be damaged or dead. Dreams are dashed. And those who are mentally unprepared and emotionally unequipped will have a very hard time adjusting. This predicted implosion has to happen. It's a mathematical result of the grave errors made by central banks and government busybodies, who mistook the low volatility and easy gains of the virtuous portion of the money printing cycle for actual success. This chart says that between 1947 and 1952, when the middle class was expanding like crazy, each new dollar of debt increased the GDP by $4.61. Today, that number is $0.08(!). 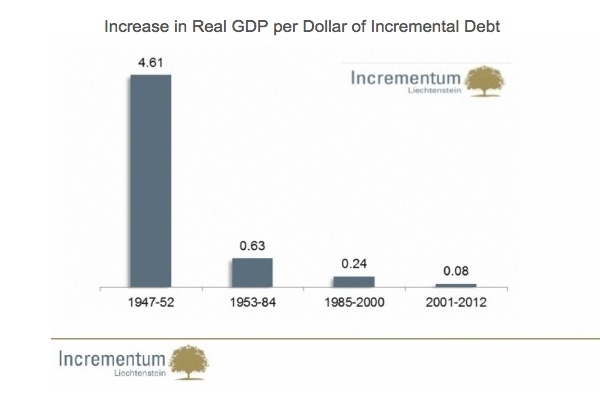 We can flip this, to say that it takes $12.50 of new debt to boost GDP by $1. Clearly this is an unsustainable trend. What's been the response from the central banks? Why to encourage more debt, of course! We need more GDP, they say, and new credit formation is critical to that process! Well, what else would you expect a banker to say? Note that the central banks are deadly mute on topics like the role of cheap debt in fostering mal-investment, to say nothing of the importance of net energy and functional ecology to the human experience. Central planners may have a lot of power because of their access to and use of the magic printing press. But their knowledge of the real world is horribly immature, if not entirely wrong. The way things tend to work is that trouble begins on the outside and works its way towards the center. The weaker periphery elements get clobbered first, the strongest last. So it’s Greece before Spain, and Spain before France. It’s the poor before the middle class, and the middle class before the rich. We can already see the signs of this process in play, but it's now accelerating. 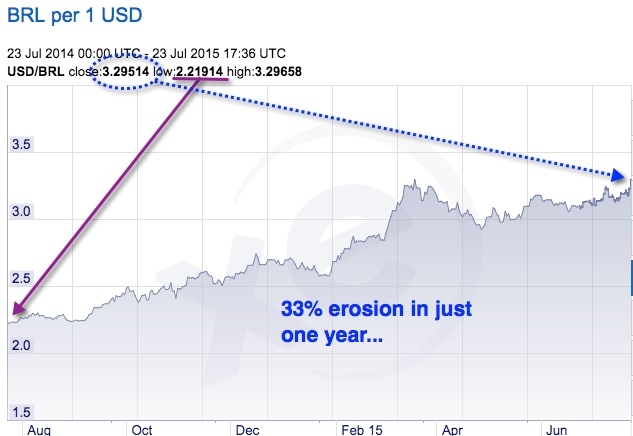 Where one Brazilian real used to be worth 45 cents a year ago, it's now worth just 30 cents. All of the hedge funds that tried to get rich off of the fat 12.5% yield that Brazilian 10-year debt offers just got their heads handed to them as a result of the plummeting currency exchange ratio. Why is Brazil tanking so hard? It’s due to a combination of challenges: corruption scandals, poor trade prospects (as commodities collapse) and growing political risk. But the big one is that it's 'miracle' economic growth has crashed into a brick wall. More than half of all muni bond funds have investments in Puerto Rican tax-exempt bonds, even though the sunny Caribbean island is an economic basket case. Its outstanding municipal debt of $72 billion amounts to $30,000 for each of the commonwealth’s residents, almost three times average annual per capita income. Puerto Rico’s ratio of debt to gross domestic product is more than triple that of any other U.S. state or territory, and the island’s economy has been mired in recession for nine years. How does a small island nation even borrow 3x average annual income per capita? It turns out it’s remarkably easy in the free-money liquidity fest offered up by the Fed. It was only a year ago that yield starved “investors” (more properly called speculators) placed $16 billion in bids for $3.5 billion of newly issued Puerto Rican junk muni bonds. In even worse shape is Venezuela. It's so far down the road to financial ruin that it's almost certainly gong to be the next victim of hyperinflation. Venezuela is about to earn another ignominious distinction. Long home to the world’s highest inflation rate, the country now is set to become the site of the 57th hyperinflation event in modern recorded history, says Steve Hanke, professor of applied economics at Johns Hopkins University. While the feat may be little more than a formality in a country where Hanke calculates annual cost-of-living increases already run at 772 percent, it’s the latest sign a debt default may be closer than previously thought. With Venezuela’s currency losing 32 percent of its value in the past month in the black market, according to dolartoday.com, and falling oil prices throttling the cash-starved nation’s biggest revenue source, the government may run out of money to pay its debts by year-end, according to Societe Generale. Derivatives traders have ratcheted up the probability of a default within one year to 63 percent, compared with 33 percent just two months ago. Things are about to get even more dire for the people of Venezuela. Already suffering acute shortages of consumer staples, they're about to experience the same type of horrific monetary devaluation that Zimbabwe did. China is anything but a peripheral country, but the import/export numbers suggest that China is slowing down hard and ripe for a crash. 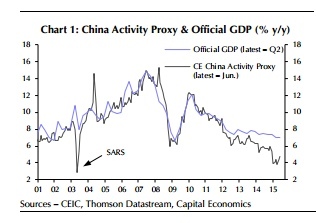 Instead of trying to gracefully manage its transition from an industrial economy to a consumer economy, China is simply plowing ahead following the same script that fostered its growth in the first place. Half the shares traded in Shanghai and Shenzhen were suspended. New floats were halted. Some 300 corporate bosses were strong-armed into buying back their own shares. Police state tactics were used hunt down short sellers. Caixin says the China Securities Finance Corporation - a branch of the regulator - now owns an estimated $200bn of Chinese stocks and has authority to buy a further $500bn if necessary to prop up the market. This use of “brute force” - in the words of Peking University professor Michael Pettis - has done the trick. Equities have recovered. How could they not do so, since selling was illegal, and not to buy was also illegal? Throwing lots and lots of new money at the problem of slowing growth and collapsing equity prices is exactly backwards from what should be done. The problem is not that equity prices are falling, it's that they are too high compared to earnings (70x trailing earnings! ).The problem is not that real estate building and sales are slowing down, it’s that too much was built and prices are already far too high (20x median income or higher!). In Part 2: Assume The Crash Position, analyzes how if deflation does indeed take over and swamp the official efforts at damage control, quite a lot of fantasy wealth in today's stock, bond and real estate markets will be destroyed. This means you want to be positioned away from risk-based financial assets right now -- with stocks and low & junk grade bonds are right at the top of that list. Cash and short maturity sovereign debt of good countries will be much better places to hang out while the storm rages. Like it or not, things are getting interesting again. The prudent move here is to watch developments very closely, position yourself defensively, and be ready to react nimbly, if necessary. After years of suppression, the forces of reality are threatening to overwhelm our managed global ""markets"'. And it's about damn time. I've been away for a while quietly getting my own house in order, but I wanted to say thank you for another cogent analysis of our predicament which appears to have crested the top of the roller coaster. I have that exact feeling in my stomach that you get when you see the track disappear ahead of you and you notice how high you've climbed. Even though I know approximately what to expect, it's still terrifying (and morbidly exhilarating?) to know that we're about to plummet from these heights. I can't see ahead of the car from this angle, but I hope the tracks are sound. Will the inertia be aloud to bleed off when we reach the bottom or will their be another engineered rise to take advantage of the energy accumulated in the coming drop? The power seems to have been cut to the tracks so if there is another hill ahead it's anyones guess if the car will make it to the top....were these things engineered to function safely when plummeting down hill in reverse? When I was a little kid my sister and I were in the back of a car involved in an accident. She had a plastic box of crayons in her lap and I had a teddy bear in mine. We both got whip lash, but she ended up with a scar and I just got a face full of bear. Then like now getting out of the car before the accident was not an option, but I sure as hell have remembered the lesson and surrounded myself with the equivalent of teddy bears. Aloha! What is it? Don't try to catch "falling knives"? McMansions are tough to catch too! I can catch falling feathers so long as its not attached to a bald eagle! "It’s the poor before the middle class, and the middle class before the rich." So here again its the "falling" part that separates the classes. I mean when you're poor you don't have far to fall. It's the middle class and rich who bought the American Dream that have the furthest to fall as they are the most indebted. Lets not forget that it was not long ago that South America and Asia were economic basket cases. In fact a lot of those nations have never known much more than dictatorship from one generation to another. Isn't China still Communist? This is class warfare. Look at Greece and it seems it is the young, who are essentially poor or poorer against the older more monied generations. The older generations do not want their home values or stocks or bonds and pensions to decline or else they will not be able to retire to their Fantasy Island of Lifestyles of the Rich and Famous! So many countries face an aging population. Can all the US babyboomers squeeze through the exit? At some point the youth assumes the political majority. Perhaps they decide not to pay into government pensions and social security and medicare. I would not blame them if they did. Now that's what I call "real deflation"!!! When a nations debt exceeds its ability to pay the currency will collapse.Bear witness. The Chinese central government knows all too well the risks of popular unrest. The Arab Spring, Greek protests, Ukraine conflict are all as a result of economic trouble leading to high unemployment. The United States, Japan, EU and other western countries have been printing money in the form of QE as well as debt-driven infrastructure spending to basically toss cash out into their economy in a desperate attempt to prop up their economies and preserve the wealth of at least the rich and politically influential citizens because it's when the rich get screwed that's when you really see social and political upheaval. Let's be clear on one thing: not everything you see is a mistake. It's all a matter of perspective. If we think that our leaders are looking out for OUR best interests then, yes, they are making terrible mistakes. But if we look at who owns the central banks and who those banks are actually serving (hint: it's themselves) then things look very different. There are games being played behind the scenes. We think they're trying to "fix" things for us. We have a distorted perspective of what is really going on. 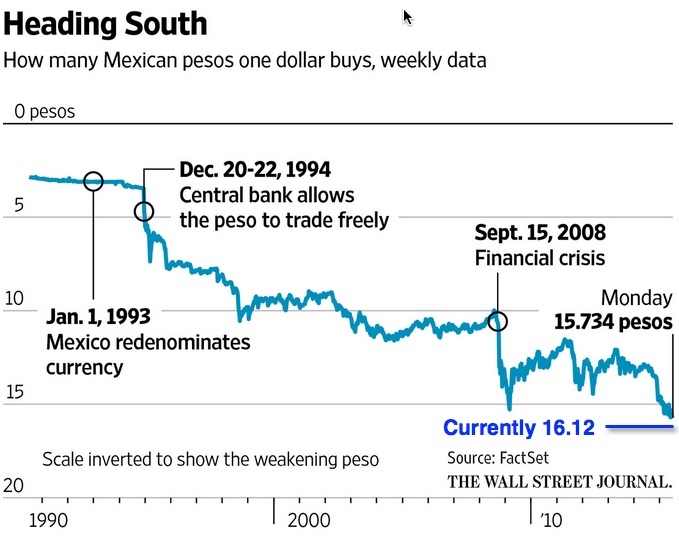 There are currency wars going on all over the world. We could actually be in the middle of World War III right now and not even know it. We assume that this war will be played with tanks and planes and bombs (again). The goal is still the same: Global supremacy, BY ANY MEANS. This game is played like King of the Mountain. Try to crash all other countries' currencies. The last one standing takes it all. Forcing another country to spend too much of its own capital on tanks and planes and bombs is but one way to crash their economy. Another is to manipulate the commodity prices that a country depends on for its income. Another way to win is to secretly hoard as much gold as you can (the real stuff) while the rest of the world is holding paper. Then light the match and watch all the paper burn while you're sitting safe in your castle made of gold. Great analysis. And probably right about gold. But...(and it's a big KKardashian but) what if there are variables at play here that we are unaware of? Also, time frames are important. The deflationary collapse followed by inflationary spiral has been predicted for over a decade and hasn't happened. Also, how is deflation defined? I just got back from the U.S. and saw little evidence of deflation and inflation wasn't that apparent, certainly not run away inflation. It's confusing because standard macro-economic theory doesn't seem to apply anymore. Many economists who think outside the box, are in agreement on that. And will it revert to the mean, because it always has, in the past? I am beginning to wonder if the whole process has deviated so far from the norm and through so many levels of abstraction, that we may as well be living in an economic wonderland fuelled by pixie dust. I am selling half of my gold bullion, hopefully next week. I won't be grounded by metal, while those who created this fantasy fly around like Tinkerbell. The fantasy could go on a good long time and I am too old to attempt to wait it out. Intangible booms and busts and tangible reality. The article provides insight into the booms and busts of the financial markets and the efforts by the powerful to ensure the masses saddle the burden. Of course, natural forces continue to operate as they have for eons and in conjunction with the technological systems of industrialized civilization in recent times. Many people will suffer from the busts of financial markets but the irrevocable decline in the operation of the technological systems will be only slow down slightly. It will be interesting to see how the financial markets behave when the unavailability of natural resources, the decline in infrastructure and the impact of climate change and ocean acidification hit all and sundry hard. I hear your argument and understand why you would choose to dump gold in your position though the idea does make me cringe. I am too young to not position my family for the peak fairy dust moment. I continue to hesitate to go very deep on gold or any other investment for that matter. They're all clearly manipulated. Instead I put a new roof on our house, new windows and I'm planning to build a deck next week. The gardens and orchard continue to expand and plans are coming together for a pond/swale system to address water security. I keep enough cash to hopefully ride out the early parts of the next downturn without having to turn my house back over to the bank. The numbers are too big and we're too late in the game for me to achieve the pipe dream of paying off the house and the student loans. So for now I opt for a cash cushion, minimal financial investments and maximum material investments in my families resiliency. I am trying to diversify my income streams as well in case something happens to my primary job....more work to do in that area. The products that may sell well after the next downturn are unfortunately still dominated by global competitors, but I'm perfecting my craft(s) learning to make things people need starting with food and moving into products like soap, deodorant, herbal medicinal oils and chap stick (small luxury). Watching what's happening in Venezuela has made me wonder if there is a way to produce toilet paper from a small homestead. Now that would be a winner! I read an article recently about a farm in Minnesota that is getting grants and crowd funding to build a 3,700' root cellar (sorry, didn't save the link). They are going to use a portion of it to extend their CSA season and rent the rest of the space to other local farms. Talk about an in demand product if the electric grid ever becomes unreliable. So glad I joined this site. Wish I understood economic better. Generally feel metals a good safe way to go, along with the farming/DIY preparations...just wish I wasn't tied to the city. Oy. Watching what's happening in Venezuela has made me wonder if there is a way to produce toilet paper from a small homestead. Now that would be a winner! I've often thought that a small TP manufacturing operation that wasn't grid dependent would be as valuable as the spinning wheel that turned straw to gold. You hear people talking about the creature comforts that will be of most value when TSHTF like booze, cigarettes, spices, toothpaste, etc, but I think that some industrious person with an infinite supply of TP could become king! It's a luxury I don't relish being without, even for a short period. A few alternatives I've used when hiking or in a pinch are any available paper, a smooth river stone, broad leaf maple leaves or young burdock leaves. Another alternative is to take a quick dip in a body of water or do as a lot of primitive cultures do and use your hand. I've read somewhere that the reason we shake with our right hand is that the left hand used to be dedicated to some of the less savory chores.....not sure if that's true, but it makes sense to keep one clean and available for things like food prep if you ever find you have to resort to that. I think I would use a frequently washed and boiled cloth before going that route. Fun fact: The farmers almanac has a hole punched in it because farmers used to hang it from a nail in the outhouse before commercial tp was available. I agree with thebrewer: If there is one item to have on hand for barter, it's toilet paper. Next on my list would be feminine products (especially some of the non-disposable options that can be used indefinitely), coffee, tea, chocolate and lower on the list is whiskey and cigarettes. I don't personally stock those because I don't want the kind of attention that they might generate in a crisis. I'm always thinking about what item(s) are going to catch me unprepared....I try to have two ways of doing most important tasks or at least back up tools. It's the consumable products that will eventually run out. That includes money and all its proxies which is why I think the most important thing we can all do is re-skill. If you can provide for your own basic needs (food water shelter), defend yourself if necessary and produce something of value to your community from locally available resources you should be better off than most. Yes, there will be massive deflation in almost everything, Except for the things you actually need, which like TP will remain about the same price. In my opinion, the one thing that will not be going down is the price of food. The demand there will only intensify until we have a reduction in the population.